We are pleased to welcome you to our location in Laredo, TX. If you are looking for weight loss surgery in the Laredo area look no further than Texas Bariatric Specialists. Founded by Dr. Nilesh A. Patel, MD, a nationally recognized and fellowship-trained bariatric surgeon, Texas Bariatric Specialists (TBS) is a holistic weight loss practice focused on delivering long-term weight loss solutions. TBS has performed over 7,000 bariatric surgeries that have exceeded the national average for successful weight loss management. With a commitment to surgical expertise, compassionate care and exemplary preoperative and postoperative services, Dr. Patel and staff at Texas Bariatric Specialists ensure successful weight loss management for their patients. Insurance Advocacy– Our staff of knowledgeable insurance specialists provide insurance qualification services to make sure your qualification paperwork is in order. This service ensures you are receiving the full benefits you are entitled to, alleviates the hassle for your, and provides you with peace of mind. We are happy to say that 80% of our weight loss surgeries are paid for by insurance. You will be assigned an insurance advocate who will answer all of your questions about insurance and will help guide you through the approval process. Just provide your insurance information and they will take it from there. 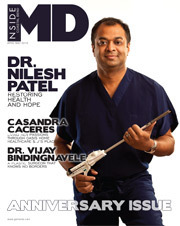 Life Partner for Weight Loss – As a nationally recognized surgeon, Dr. Nilesh A. Patel, MD, believes in long-term relationships and forming partnerships for success. Psychologist – A staff psychologist is available for all patients’ pre-op and post-operative treatment, to assist with successful, long-term weight loss. Dietician – A certified dietician/nutritionist who specializes in the unique needs of bariatric surgery patients and will provide both private consults and group sessions before and after surgery. Nutritional Resource Store – A convenient, in-house nutritional supplement store with pharmaceutical-grade supplements. Support Group – An online support group to help you keep on track and create a forum to discuss issues. Texas Bariatric Specialists is more than a surgery center; it is a group of highly trained professionals focused on ensuring your health for a lifetime. Contact us today or register for an upcoming FREE Seminar to get started. Will my Insurance cover my Surgical Weight Loss Procedure? What are my Financing Options for my Procedure?